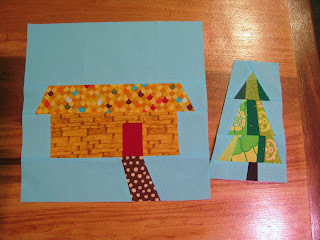 In my quilting bee we are doing house blocks this month. 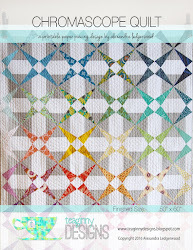 Malama sent us bright, saturated prints and an aqua blue sashing to make any type of house we wanted, as long as it wasn't tiny. It was to be 12.5 inches high and any width we liked. My house block is 12.5 square. I hoped to put a tree on one side, but I ran out of the sashing. Hopefully she can add sashing and join the tree to the block, if she wants. 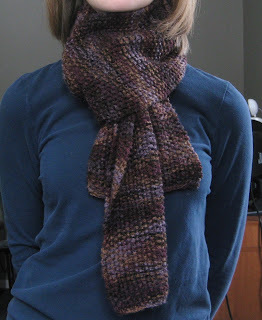 I'm a novice knitter, so this scarf is just a simple seed stitch. 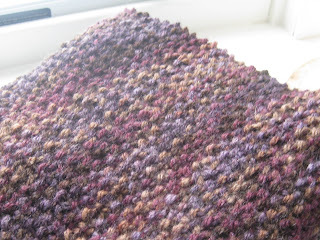 I liked how the variation in color in the yarn made a pattern. I think it looks like a zigzag. We have a white Christmas and two excited little boys, so the holiday feels extra festive this year. 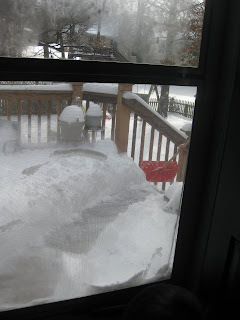 'Course I'm not the one shovelling the deck in this picture so the dogs will go out! 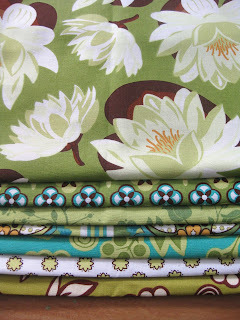 This stack of fat quarters from Sally Henderson's Ginger Blossom line made one of my wishes come true. Thanks Val! 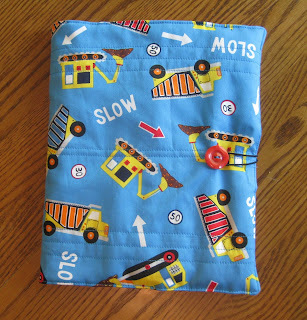 I've been meaning to make a crayon and coloring book carrier for my older son for a while now. I couldn't find a tutorial or directions, so I just plunged in. It turned out well in that everything fits and works, but there a few things I'd do differently next time. 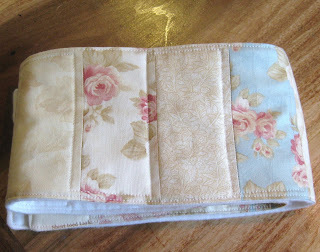 It needs interfacing or maybe even innerfuse for the front cover. It needs to be a little stiffer there. 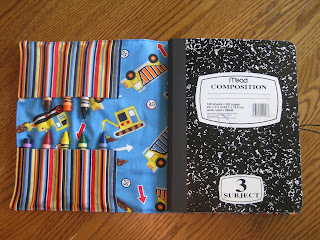 The back is stiff because of the notebook, but the front sags a bit and the crayon shapes show through. 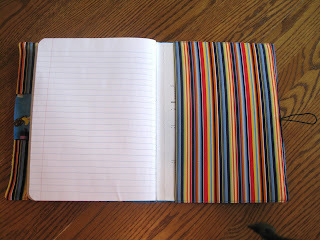 No biggy, but it would be nice if it looked more notebook like. 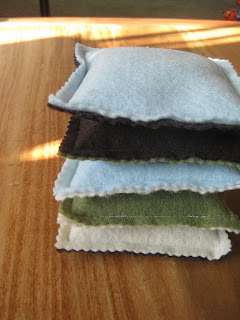 Next, some easy felt beanbags. I filled mine with lentils. 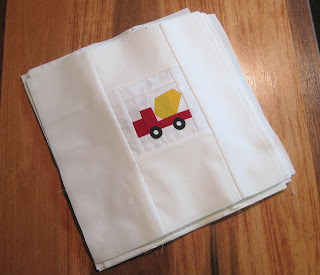 I saw something like this on Sew Mama Sew a while ago, but no pattern or tutorial was offered. I had the idea in the middle of the night (why does that happen anyway?) 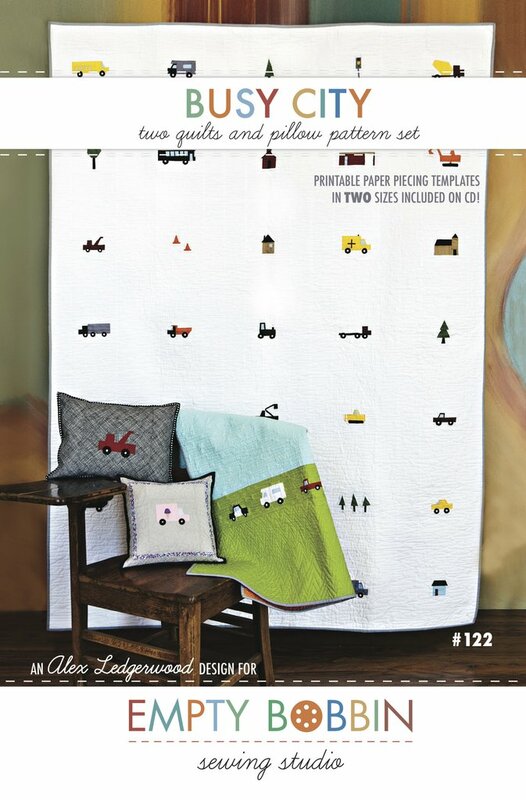 to make one using charm squares. This went together so quickly! I just cut the charms in half (I only used nine) and sewed them together in a long line. 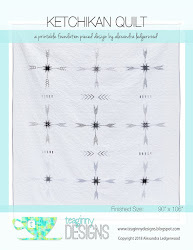 Sandwiched with batting and a soft white flannel, I had a cute scarf to quilt. 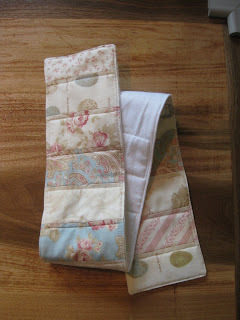 I just used straightline quilting and sewed a loop onto the front of one end. 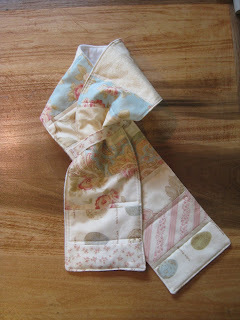 This makes a great closure for toddlers, as it keeps the scarf snug but not tight and best of all - it stays on! 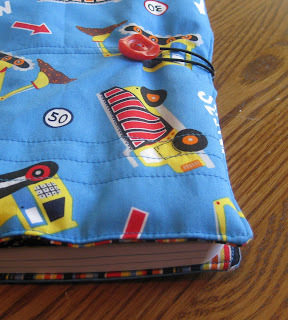 I don't have any little toddler girls to give this to, but if you do, it's available in my etsy shop. 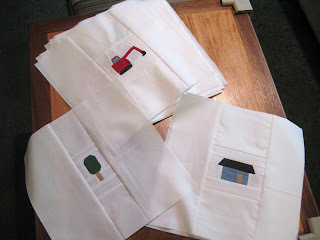 Edited to add: Someone on the SewMamaSew forums asked for more explanation of how to make this, so I thought I'd link what I wrote there in case anyone is interested. 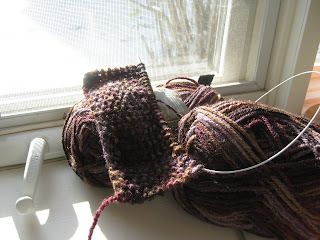 I went through a knitting phase a few years ago, but I haven't picked up my needles since. A special lady asked for a scarf for Christmas though, so I dug out my supplies and got some new yarn. Boy was I rusty. I had to unearth my instruction book. After a few false starts, I'm back in the groove, and I'm really enjoying it. Yes, that's snow out the window, and I find there is something really cozy about knitting in this cold weather. With quilting, which I normally love, there is so much up and down: sit to sew, up to cut and press, in the closet to find something, etc. With knitting, you just get to sit. And in this weather, all I want is an excuse to just sit. That means nine more to go. I don't think I'm going to make it in time for Christmas. Oh well, there is always his birthday :). The 26 finished blocks seem like quite a stack to me at this point, having sewn on sashing two nights in a row. I like the negative space, but boy have I used a ton of Kona white!